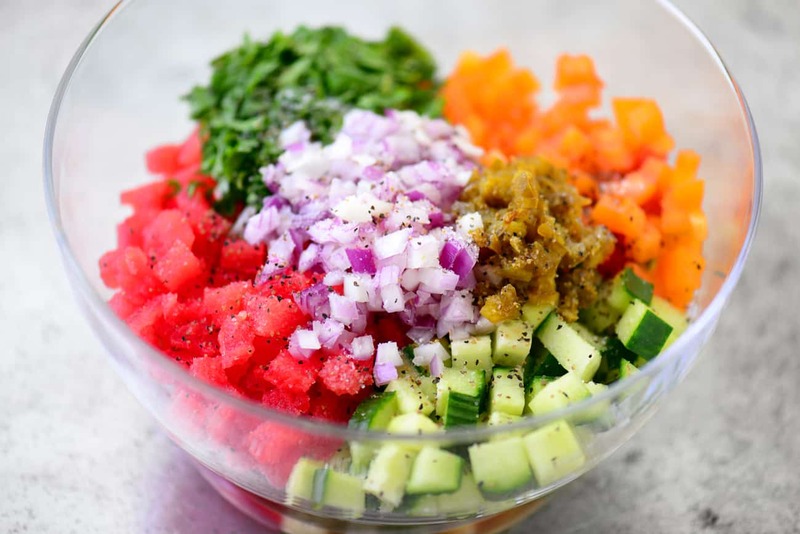 This watermelon salsa recipe is so fun when served from a watermelon bowl! It is delicious with chips or on top of grilled chicken, salmon, or tacos. Does any other fruit say summer like watermelon does? Every summer party, picnic and backyard cookout from as far back as I can remember included watermelon. We love it sliced into triangles, cut up in a fruit salad, and blended into raspberry watermelon lemonade. 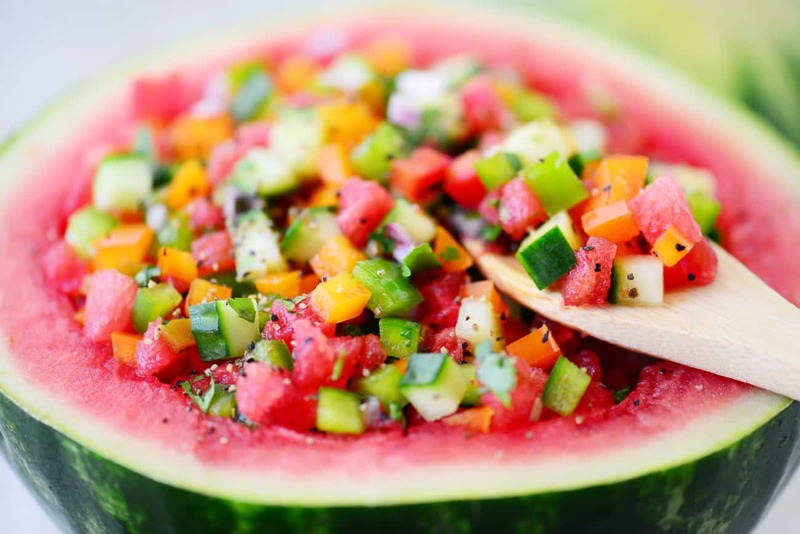 This watermelon salsa recipe is another delicious way to enjoy summer watermelon. 1. For this recipe pick a small/personal size watermelon because it is the perfect size for a bowl. 2. Choose a watermelon that will lay flat on a table. Test it out at the store by setting it on a flat surface or even the floor. 3. Pick a watermelon that is symmetrical (if cut in half the two sides would be the same) and is free of gashes, bruises or soft spots. 4. Look for a creamy, buttery yellow spot where the watermelon laid on the ground. A greenish-white spot means that is wasn’t left to ripen long enough. 5. Compare the weight of the watermelon with others similar in size and choose the heavier one for the juiciest watermelon. 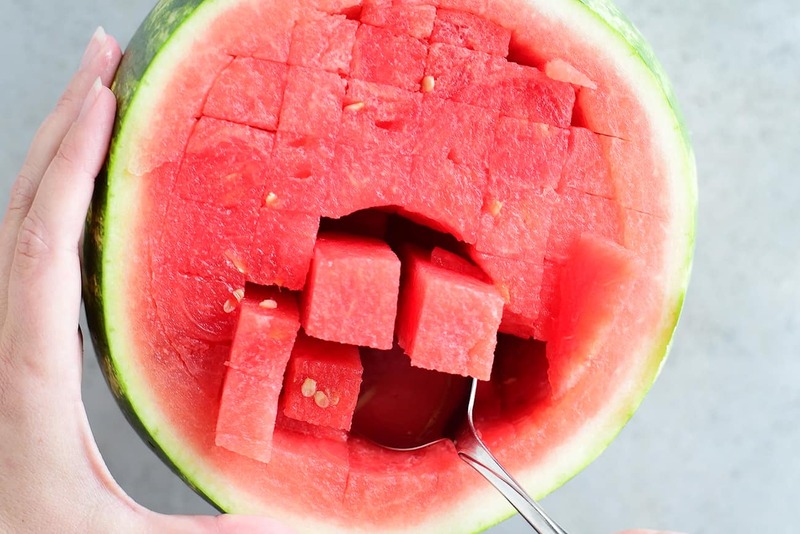 Lay the watermelon on its side and cut the top 1/4 to 1/3 off. 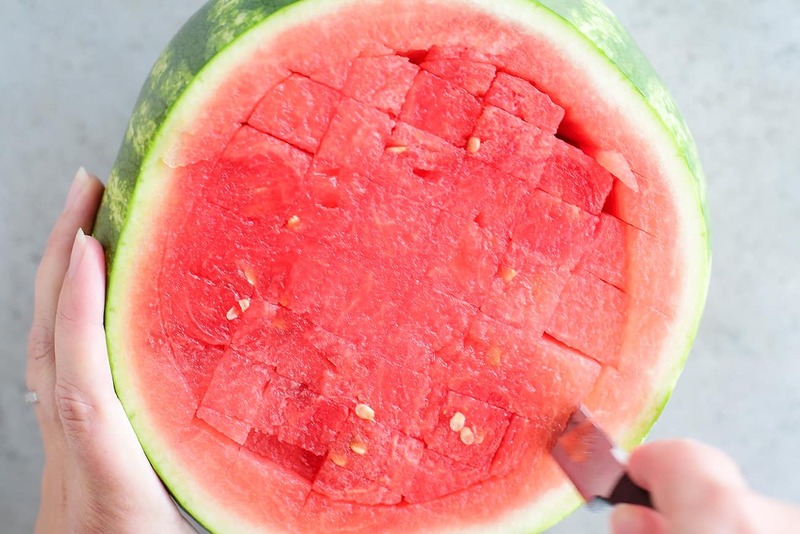 Cut slices into the flesh of the watermelon in a crosshatch pattern without going through the rind. Make a cut all of the way around the watermelon between the flesh and the rind. 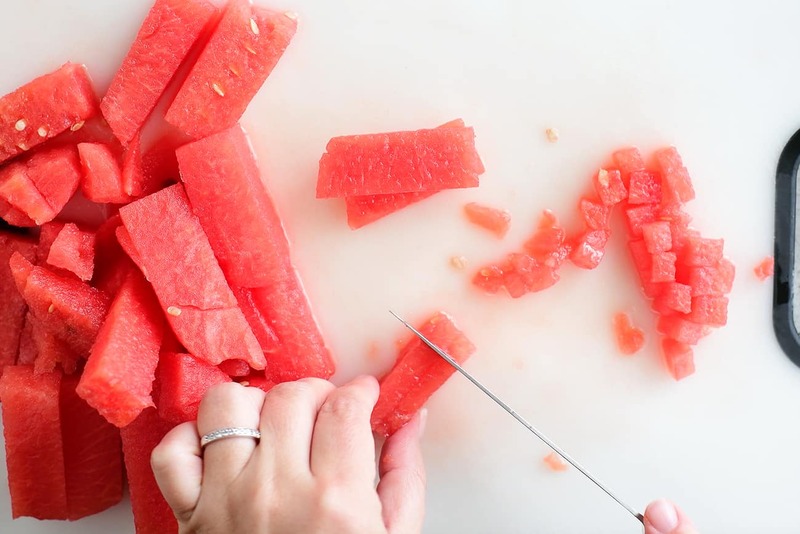 Scoop out the watermelon slices, set them on a cutting board and dice into small pieces. Hollow out the rest of the watermelon and dump out the juice so that it can be used as a bowl. Dice enough watermelon to measure one cup for the watermelon salsa and save the remaining watermelon for another use. Dice one cup of cucumber. I chose an English seedless cucumber and didn’t peel it to keep the bright green color. Dice one cup of bell peppers. Use any combination of colors. 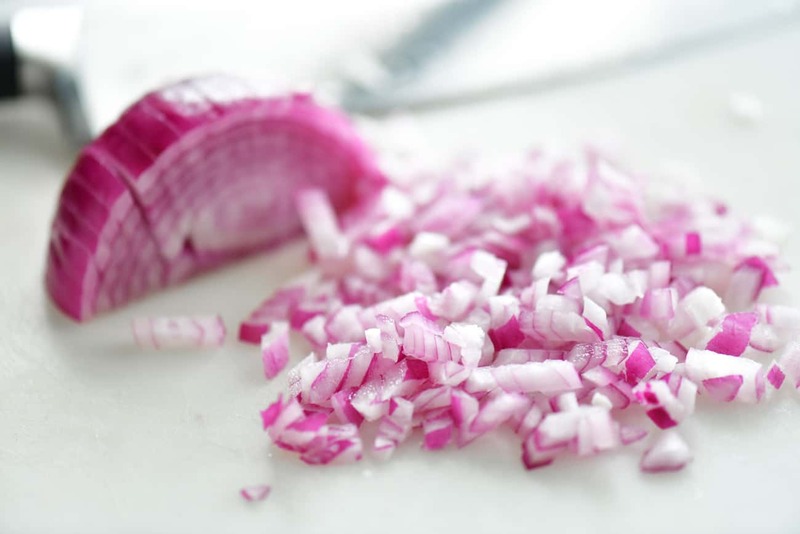 Dice one cup of onions. 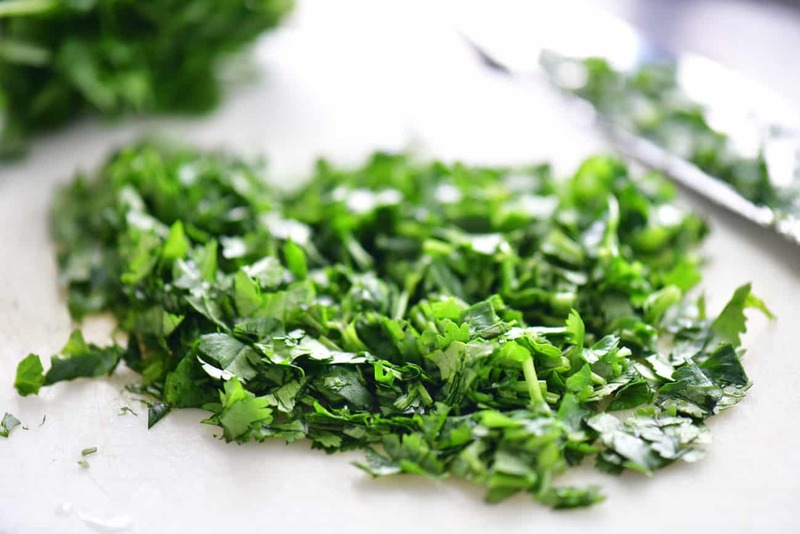 Chop 1/3 cup of cilantro. 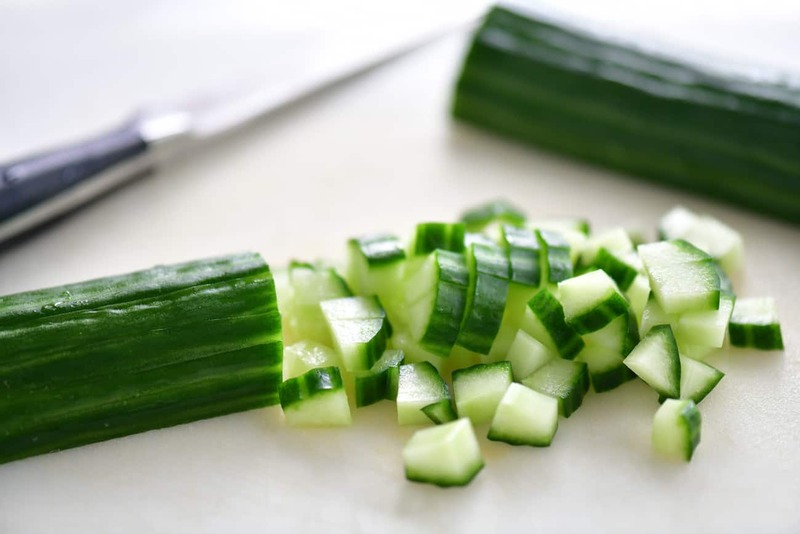 Put the diced watermelon in a bowl and add the cucumbers, bell peppers, onions, cilantro, jalapenos (optional), lime juice, salt, and black pepper. 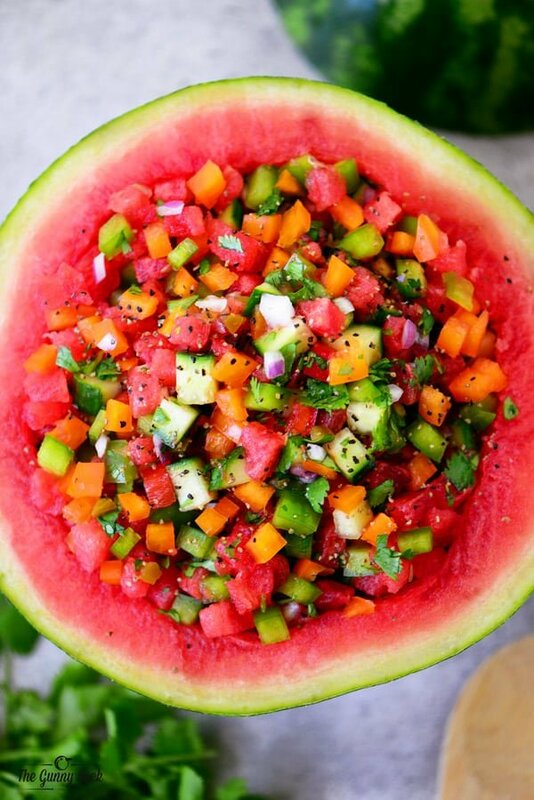 Mix everything together and taste the watermelon salsa. Add additional lime juice, salt, and black pepper, if needed. Scoop the watermelon salsa into the hollowed out watermelon bowl. 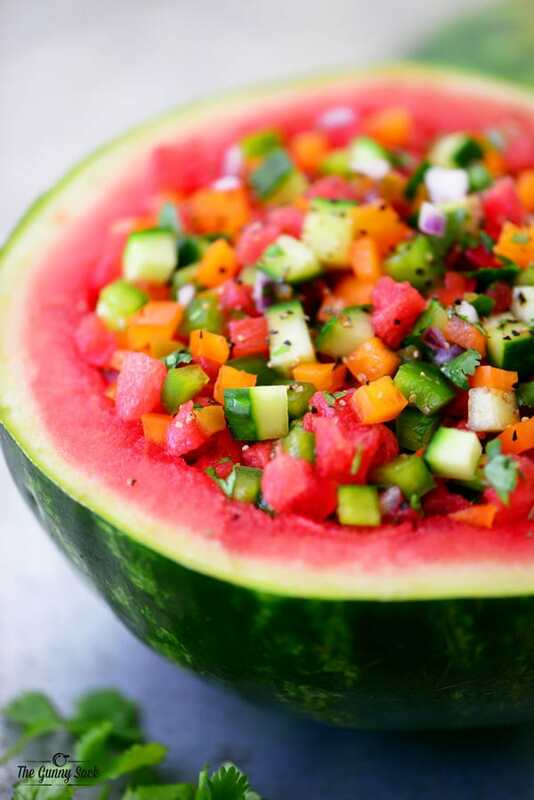 Serve the watermelon salsa directly from the watermelon bowl. 1. How do I cut the watermelon and keep the rind for a bowl? I’ve done my best to describe it in words and with the step-by-step photos but you can also watch the watermelon salsa video to see the recipe in action! 2. What else can I add to this salsa recipe? 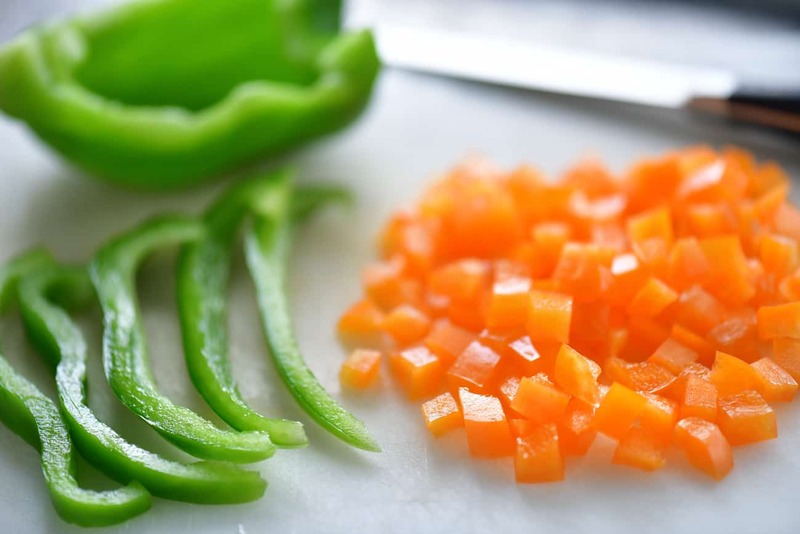 Try adding more fruit and veggies such as corn, tomatoes, zucchini, strawberries, mango, or pineapple. You could also add garlic, black beans, or avocados. 3. What should I serve with pineapple salsa? To use this salsa as a dip for an appetizer or snack, serve it with tortilla chips. To enjoy it as part of a meal, serve it over cooked chicken or fish, or on top of tacos! 4. 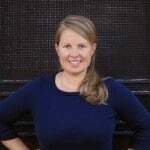 Can I use bottled lime juice? Yes, you can use freshly squeezed lime juice or bottled. 5. Would it be okay to use lemon juice instead of lime juice? Yes. I LOVE lime juice so that is what I use but lemon juice would work as well. 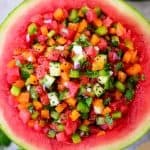 I was wondering if I would like this watermelon salsa as much as I like my pineapple salsa and I did! I’ve also tried adding diced tomatoes to this recipe and loved it that way too. Pineapple Salsa from The Gunny Sack: This pineapple salsa recipe has a delicious combination of sweet and spicy. It can be served with grilled chicken or fish or as an appetizer with chips. Corn Salsa from Culinary Hill: A sweet salsa with medium heat, copycat Chipotle Corn Salsa recipe has two chilis (one of them roasted!) and plenty of corn for maximum flavor. Apple Mango Salsa from The Gunny Sack: We love the fresh taste of Apple Mango Salsa! Try this easy recipe with chicken, with tacos or with chips. Slow Cooker Restaurant Style Salsa from The Recipe Critic: Slow Cooker Restaurant Style Garden Salsa has so many delicious and fresh ingredients and uses up all of those garden tomatoes. Pomegranate Fruit Salsa from The Gunny Sack: This Pomegranate Fruit Salsa recipe is fun to serve from pomegranate bowl at holiday parties! The diced fruit is perfect with crispy baked cinnamon chips. Scoop out the watermelon slices and set them aside on a cutting board. Dice enough watermelon to measure one cup. Save the remaining watermelon for another use. Put the diced watermelon in a bowl and add the cucumbers, peppers, onions, cilantro, jalapenos, lime juice, salt, and black pepper. Mix everything together and taste the salsa. Add additional lime juice, salt, and black pepper, if needed. Scoop the watermelon salsa into the hollowed out watermelon bowl. 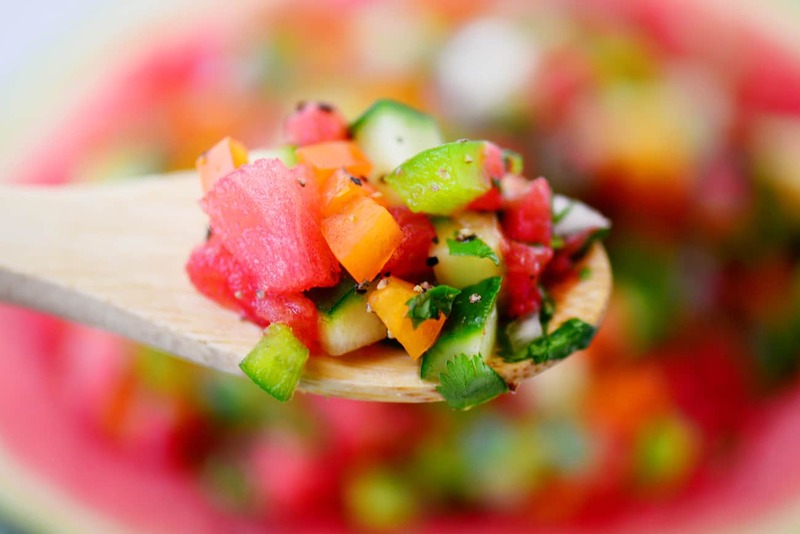 Serve the watermelon salsa directly from the watermelon bowl. This recipe was a big hit at my house. I served it as a salad to accompany carne asada and chicken tacos. The only thing I did differently was to cut the watermelon, cucumbers, and bell peppers into larger chunks. Favorite new recipe of the summer. Thank you! How do you cut the watermelon IN the watermelon itself?? First cut the watermelon in half or cut off the top third of the watermelon. 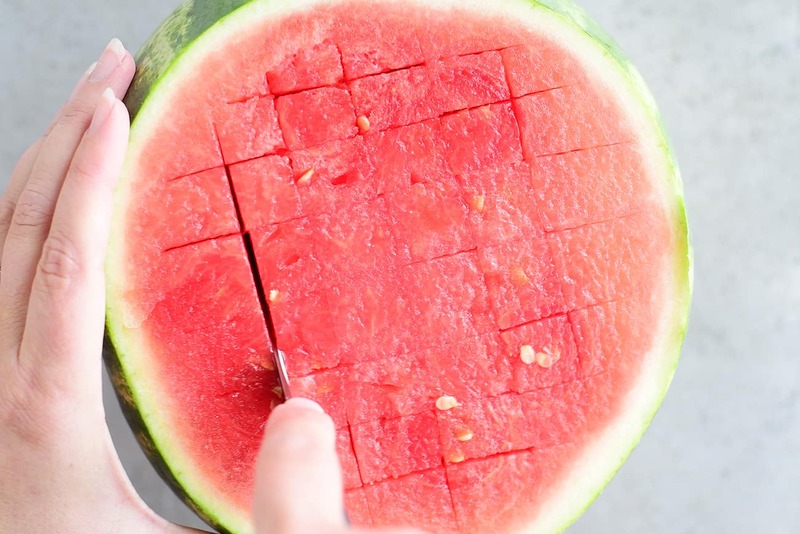 Use a long knife with a pointed end to make cuts, in a grid pattern, through the flesh of the watermelon without cutting the rind. Then, cut around the outer edge of the flesh, again without cutting the rind. The bottoms of each piece of watermelon are still attached but use a long-handled spoon to scoop them out. I will try to make a video showing how I do it sometime soon so that I can add it to the post. 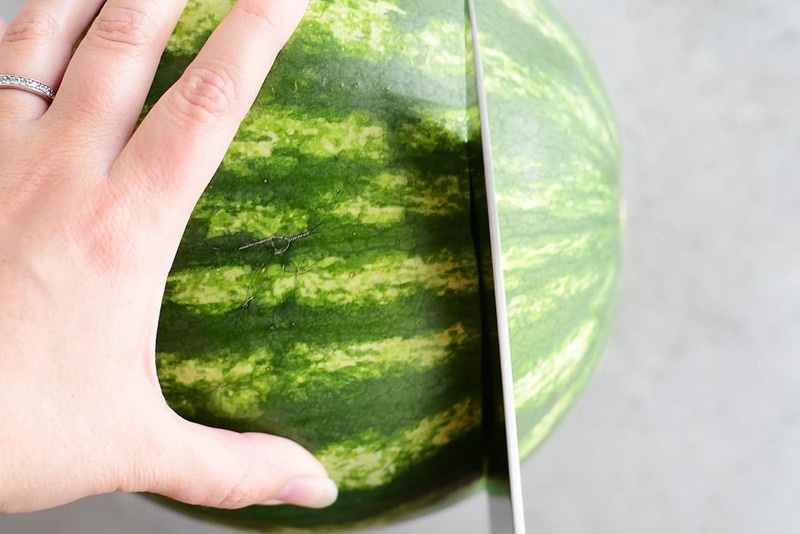 The second picture in the blog post shows what the watermelon looks like once the cuts are made. Thank you so much for sharing! They both look lovely.